Gregory Corso exploded onto the Beat scene in the mid-1950s when the names Jack Kerouac, Allen Ginsberg and William S. Burroughs were changing the course of American literature. Corso added a street appeal to Beat poetry that may have been lacking in the works of others who had more elitist backgrounds. Corso had been a real live juvenile delinquent, in and out of reform schools and written off by society as a wayward youth. But while in prison he learned to read—and he read deeply and began to produce his own poetry, showing a rare perception and facility with words. 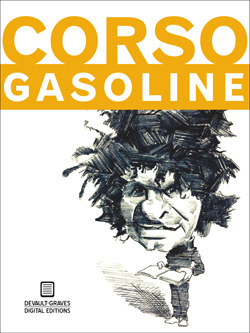 Gasoline was Corso's first major work, originally published in 1958 by City Lights Books, the essential publisher for the Beat Generation. Corso carved a place for himself among the Beats, achieving a fame in poetry arguably second only to Ginsberg. In Gasoline readers will see the emergence of a major new poet, a talent with an unbridled lust for life and a desire to put his unique stamp on all that he saw in the world around him. * Our print edition of Gasoline includes The Vestal Lady on Brattle as a bonus. As many of the Beats left for San Francisco, Corso chose a different path and moved to the area around Harvard University, where he acquired knowledge by stealth, pretending to be a Harvard classman. As writer Ed Ward describes in the Afterword to this volume of Corso's poetry, Corso was ratted out by some of the students who apparently resented that he was enjoying the campus life for free. However, once it was discovered how talented the young poet was he was allowed to stay, and other more appreciative students bankrolled The Vestal Lady on Brattle, Corso's first book, published privately and later picked up by City Lights Books, Lawrence Ferlinghetti's renowned imprint for the Beat writers.